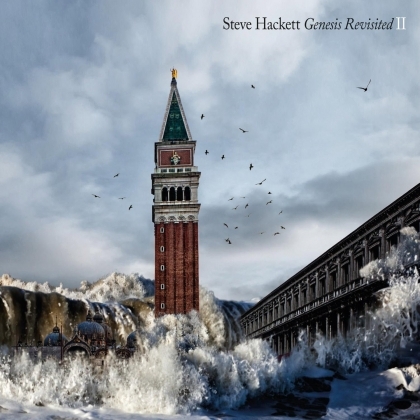 Steve Hackett's latest album is a follow up to 1996's "Genesis revisited" (I'm sure you'd never have guessed that from the title would you). The album is going back to Genesis in the 70's and taking some of those songs and remaking them. Recording new versions of songs is like remaking or updating a classic film - the results can be fantastic or they can bitterly disappoint fans. George Lucas updated the Star Wars films and divided opinions strongly, and caused controversy by doing so. Re-recording much loved classic songs has the potential to upset fans who are so used to the originals, but equally there is the potential to delight fans and fulfll the artists vision. Often a song gets released when it's not quite how the artist envisaged it, sometimes down to lack of time or down to cost. Re-recording the song can allow the artist to get the song just how they originally envisaged it. As an example, on this album Steve Hackett has used real string instruments rather than using the Mellotron (effectively samples via a keyboard). There are several guest vocalists - Steven Wilson (Porcupine Tree), Mikael Akerfeldt (Opeth), Simon Collins (Phil Collins’ son), Amanda Lehmann, Conrad Keely, Francis Dunnery, Neal Morse, John Wetton, Nad Sylvan and Nik Kershaw, and these different voices help give a different feel to the various songs. Other musicians guest on guitar, drums and other instruments. It's always slightly strange hearing a new version of a song you're familiar with, but I have to say I'm really impressed by these new versions - close enough to the originals to keep most fans happy, but with differences ranging from quite subtle to quite noticeable. I've really enjoyed listening to this album and I'm sure Genesis fans are going to be more than happy with it. Classic songs revisited and (in my opinion) improved. An excellent album that Genesis and Steve Hackett fans should certainly listen to.